Before you start on your fitness journey you need a clearly defined specific goal/destination, you need to know where you’re going and why? before you start. Fitness goals are: Specifying a clearly defined understanding of exactly what you want to achieve, and why! The steps you need to take to make these changes. Understanding what you need to help you and a realistic understanding of how long it will take and the amount of effort and dedication you need to exert to achieve your goals. Fitness goals are your way of understanding and managing your own expectations. I always insist on all my clients setting their fitness goals and writing them down before I even start to make their program. I firmly believe that setting fitness goals before you start can be the biggest factor between staying motivated and on track or straying from the path and falling short. The first step to creating successful fitness goals is to work out for yourself, exactly what it is you want, how it will look when you achieve it, how it will make you feel when you achieve it and why you want to achieve it and make these changes to your life. The more emotion and deep understanding of feelings it creates that you can attach to your goal the more you will want to achieve it. You want to transform your body for a reason, why are you doing it now? What has stopped you before? Why are you not currently happy with your appearance? The more questions you can answer and the more vivid the picture you can paint in your mind about what you want the more attainable your goal will appear. The Mistakes We Make Setting Fitness Goals! 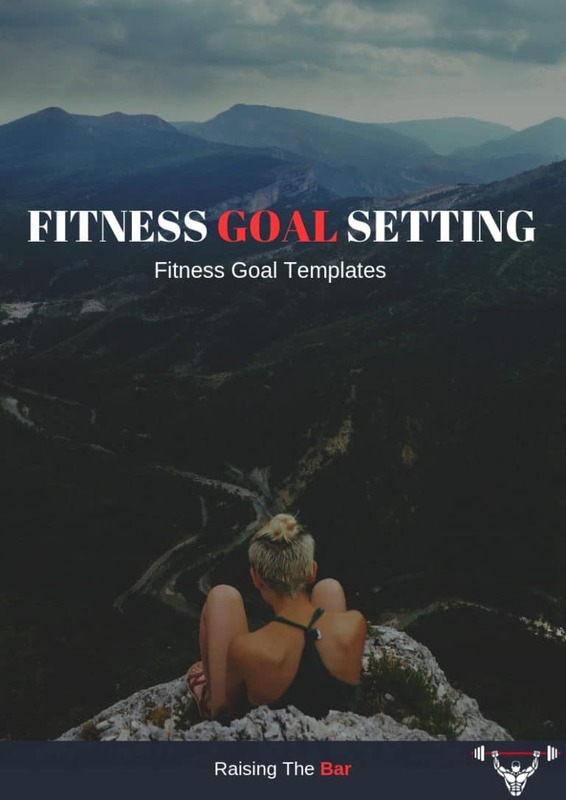 Fitness goals are extremely important this is the first step in creating a stable foundation (mindset) to set yourself up for body transformation success. Not having a goal – The worst mistake you can make is to not have specific goals set out or believing that “wanting to lose weight” or “gain muscle” is the goal. Vague, undefined and unmeasurable goals are more a list of wants then structured life-changing goals. Having an overwhelming list of wants – 9 times out of 10 when I ask someone their fitness goals they respond with “I want to lose weight, get fit, gain muscle but not get bulky, get strong, tone up, be flexible and be fast” These are what I consider a list of wants and some of them are achieved in very different ways. Having a list of wants like this is completely overwhelming and almost impossible to make a clear path and stick to. Unrealistic expectations for your goal – We all want to change our bodies and we all want to achieve it in the quickest time possible but this is one area that takes time and you need to be realistic before you begin or you will quickly become disheartened and demotivated. Not making it SMART – I am sure you have all heard of SMART goals (if not see below). Although I don’t believe that smart goals are applicable for all goals it most defiantly applies for fitness goals. Your goal should be specific, measurable, attainable, realistic and timely. Not knowing your why! – This topic will be covered in detail in my next post. To be successful on your fitness journey you need to identify and know why! why you want to achieve this goal! You need to make your goal SMART it needs to be specific, measurable, attainable, realistic and timely. OK, so lets say for example your number one goal is to lose weight and your why is because you are not happy with your current weight your confidence and self-esteem is at an all-time low and you have body issues due to excess weight and now is the time you are ready and want to make this change! Measurable – To ensure you are staying on track you need to measure progress every step of the way. Track as you go (vital). Track your food, your training sessions, your weights and your body measurements. You need to do this from day one and keep it ongoing until you reach your goal. A successful goal will have milestones or mini goals at different points by tracking you can see if you are on track if at any point you are falling behind find out why eliminate it and get back on track asap. Attainable – What action do you need to take to achieve your fitness goals? Break the goal down into smaller mini-goals or milestones. For example, if you want to lose 1 stone in 2 months you need to lose 0.6 pounds a week minimum. How will you do this by going to the gym 3 times a week, eating clean healthy nutrient dense food and tracking your calories and macros and sticking to the plan 100%. Realistic – The goal needs to be realistic to you, your lifestyle and your starting point. Know your limitations, it has to be a challenge and push you outside of your comfort zone but also allow success with your skills and time available. If you don’t know what is a realistic time frame then please just contact me using the contact form and ask I will be happy to advise you. Timely – Your goal needs an end date, all goals must have a destination and a definite end date, a goal without a destination is a wish. Your end date needs to be realistic and attainable to you and your starting place. Remember there are no quick fixes or magic pills, don’t put yourself under way to much pressure make it realistic but still challenging at the same time. When it comes to creating your fitness goals I recommend setting 3 goals a long-term goal, medium term and short-term. The long-term goal is the main priority! The number one thing that needs to be changed. This will be the one part of yourself you want to change and improve that your why is connected to. You need to focus on one long-term goal at a time once you achieve it you can move on to the next goal. You can only follow one path at a time as not all paths lead in the same direction. The medium and short-term goals will be steps, things you have to change and adapt to achieve the long-term goal (they are all on the same path). Your long-term goal should be 6 months to 1 year long. Lots of people set there main goal to be the length of the program they are following, in my opinion, this is counterproductive the program or programs need to be made to accommodate the goal. The time it takes to achieve your goal may be longer or even quicker than you think but if you finish before you have achieved it, even if you make great results you will never be fully happy. It is very important with all goals that you write them down as this increase the odds of you achieving them. Medium-term fitness goals are a smaller goal that you need to achieve on the path to achieving your long-term goal. Medium-term goals should be your sticking points as in the first medium-term fitness goal you make is the thing that you believe will be the hardest in achieving your long-term goal. Once you achieve this goal you can focus on the next sticking point, if you feel you need to focus on the same area than the next goal will be slightly harder as in going to the gym 5 times a week instead of 3. 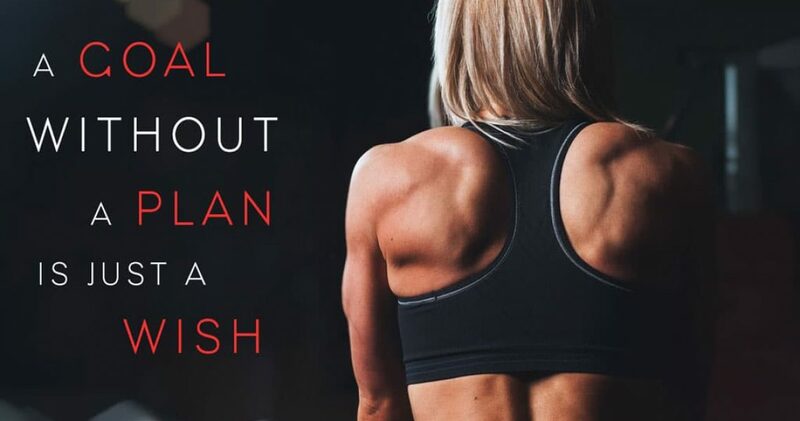 Medium term and short-term fitness goals are a way of breaking your goal down into manageable bite-size pieces to ensure you don’t become overwhelmed and achieve your fitness goals. Mini goals (short-term goals) are the medium term goals broken down into smaller steps or pieces. So in the last section, we made a medium goal using that goal we are going to break it down in week-long mini goals. So the first mini goal will be (first week of the journey) “This week I will start my new program. I will go to the gym 3 times this week on Monday, Wednesday and Friday for a full 1-hour session as laid out in my plan. I will track each session as I go. Breaking down the goals not only makes them easier to follow but it helps build and strengthen your mindset. Each mini goal achieved gives you a greater sense of accomplishment, increase confidence and means your one step closer to your overall destination. Writing down your goals is extremely important, this step is not only reaffirming your goals to yourself, but it is helping to create a more vivid image of your goal in your mind and it enables you to look at and reaffirm your goal any time you need. 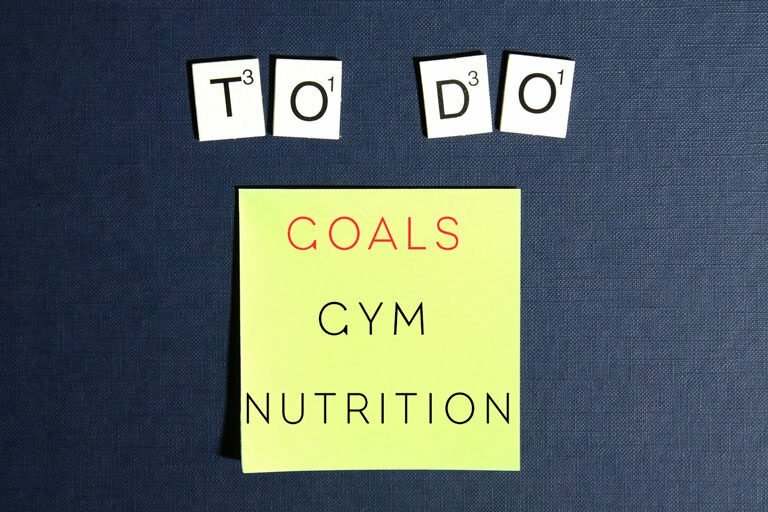 To help cement your fitness goals and ensure you don’t lose focus here is what I recommend you do with your goals after you write them down. The medium-term goal you will put somewhere where you see it on a regular basis like on the front of the fridge. The mini goal is the one you will be following so this you will put somewhere you will see it everyday i.e. a post-it note on your work computer or on the back of the bedroom door etc. Each time you successfully achieve a medium-term goal you will relook at your long-term goal to create the next medium-term fitness goal based on your current sticking point. Perfect so now we have the fitness goal setting theory we are going to put it into practice. I have created some printable gifts for you in the form of goal setting templates and examples. To reaffirm what we have just learnt and to get you started on your fitness journey. 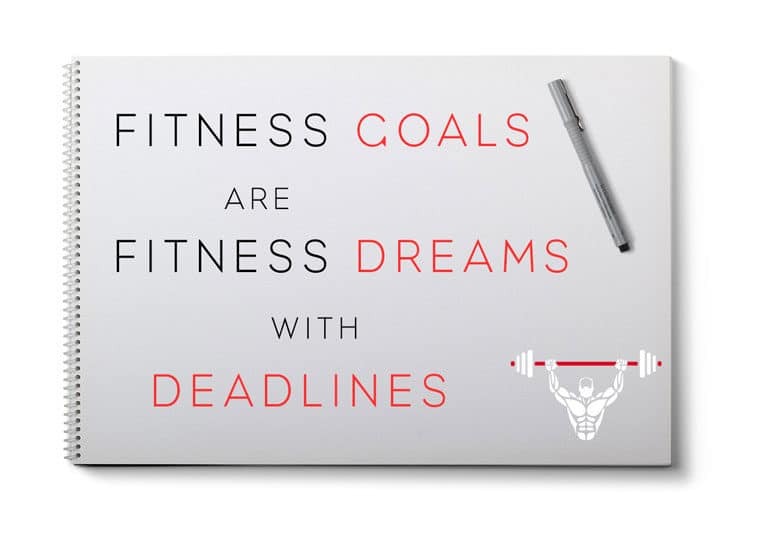 I want you to print these templates and fill them out, setting your fitness goals. PDF Workbook including goal setting templates and examples. Start your fitness journey by creating your fitness goals today!